The Inquisition began its eighteen day formal interrogation of Galileo Galilei for his heliocentric views that ended on April 30 with his conviction. A. De Gasparis discovered asteroid #10 Hygiea. M. Wolf discovered asteroid #531 Zerlina. Pierre Prier made the first non-stop London to Paris flight in 3 hours 56 minutes, flying 290 miles (466 km) in a Bleriot XI (11) monoplane. Sir Frank Whittle began testing the first turbojet engine to be built and run in the world, at the British Thomson-Houston factory in Rugby, England. G. Kulin discovered asteroid #1489 Attila. The first launch of the Japanese "pencil" rocket took place. USSR launched Vostok 1 on a single orbit flight with cosmonaut Yuri Gagarin aboard, the first human in space. Soviet cosmonaut Colonel Yuri Alexeyevich Gagarin was the first human in space. Gagarin piloted the Vostok 1 mission which launched 12 April 1961. His flight lasted 108 minutes and orbited the Earth once. Because of concerns of adverse reactions to due to experiencing weightlessness, the manual controls on the spacecraft were locked prior to launch and the entire flight was under the control of ground personnel. The spacecraft consisted of a nearly spherical cabin covered with ablative material. There were three small portholes and external radio antennas. Radios, a life support system, instrumentation, and an ejection seat were contained in the manned cabin. The cabin was attached to a service module that carried chemical batteries, orientation rockets, the main retro system, and added support equipment for the total system. This module was separated from the manned cabin on reentry after one orbit. The spacecraft landed in Kazakhstan (about 26 km southwest of Engels) 1 hour 48 minutes after launch. The Vostok spacecraft was designed to eject the cosmonaut at approximately 7 km and allow him to return to Earth by parachute. Although initial reports made it unclear whether Gargarin landed in this manner or returned in the spacecraft, subsequent reports confirmed that he did indeed eject from the capsule. Radio communications with Earth were continuous during the flight, and television transmissions were also made from space. NASA's GT-1 spacecraft re-entered the Earth's atmosphere on its 64th orbit. Gemini 1 was an uncrewed orbital test of the Titan 2 launch vehicle, the Gemini spacecraft structural integrity, and the launch vehicle-spacecraft compatibility. The test covered all phases through the orbital insertion phase. Other objectives were to check out launch vehicle-spacecraft launch heating conditions, launch vehicle performance, launch vehicle flight control system switch-over circuits, launch vehicle orbit insertion accuracy, and the malfunction detection system. This was the first production Gemini spacecraft and launch vehicle. The Gemini 1 launch took place on 8 April 1964 at 11:00:01 a.m. EST from Complex 19 at Cape Kennedy, Florida. Six minutes after launch, the Titan 2 booster placed the Gemini spacecraft and the attached second stage in a 160.5 x 320.6 km orbit with a period of 89.3 minutes. An excess speed of 22.5 km/hr sent the spacecraft 33.6 km higher than planned. Mission plans did not include separation of spacecraft from the 3.05 meter diameter, 5.8 meter long Titan stage 2, both orbited as a unit. The planned mission included only three orbits and ended about 4 hours 50 minutes after launch with the third pass over Cape Kennedy. The spacecraft was tracked until it reentered the atmosphere and disintegrated on the 64th orbital pass over the southern Atlantic on 12 April 1964. The systems functioned well within planned tolerances and the mission was deemed a successful test. USSR Soyuz 33 returned to Earth after failing to dock with the Salyut 6 space station. NASA launched the first Space Shuttle mission from Cape Kennedy, Florida, using the orbiter Columbia. NASA launched STS 51-D (Discovery 4, 16th Shuttle mission) carrying the TELESAT-I and SYNCOM IV-3 communication satellites to orbit. The STS 51-D launch was first set for 19 March 1985, but rescheduled to 28 March due to remanifesting of payloads from the canceled Mission 51-E Shuttle flight. The launch was delayed further due to damage to the orbiter's payload bay door when a facility access platform dropped. The launch on 12 April was then delayed 55 minutes when a ship entered the restricted solid rocket booster recovery area. The TELESAT-I (ANIK C-1) communications satellite was deployed from STS 51-D, attached to Payload Assist Module-D (PAM-D) motor. SYNCOM IV-3 (also known as LEASAT-3) was deployed also, but the spacecraft sequencer failed to initiate antenna deployment, spin-up and ignition of its perigee kick motor. The STS 51-D mission was extended two days to make certain the sequencer start lever was in the proper position. 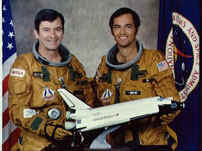 Griggs and Hoffman performed a space walk to attach "flyswatter" devices to the remote manipulator system. Seddon engaged the LEASAT lever using the remote manipulator system but the post-deployment sequence did not begin. Other payloads carried by STS 51-D were: Continuous Flow Electrophoresis System (CFES) III, flying for sixth time; two Shuttle Student Involvement Program (SSIP) experiments; American Flight Echocardiograph (AFE); two Get Away Special (GAS) cannisters; Phase Partitioning Experiments (PPE); astronomy photography verification test; medical experiments; and "toys in space," an informal study of the behavior of simple toys in a weightless environment, with results to be made available to school students. STS 51-D ended 19 April 1985 when Discovery landed on revolution 110 on Runway 33, Kennedy Space Center, Florida. Rollout distance: 10,298 feet. Rollout time: 63 seconds. Launch weight: 250,891 pounds. Landing weight: 198,014 pounds. Orbit altitude: 285 nautical miles. Orbit inclination: 28.5 degrees. Mission duration: six days, 23 hours, 55 minutes, 23 seconds. Miles Traveled: 2.9 million. Extensive brake damage and a blown tire during landing prompted landing of future flights at Edwards Air Force Base until implementation of nose wheel steering was effected. The flight crew for STS 51-D was: Karol J. Bobko, Commander; Donald E. Williams, Pilot; M. Rhea Seddon, Mission Specialist 1; Jeffrey A. Hoffman, Mission Specialist 2; S. David Griggs, Mission Specialist 3; Charles D. Walker, Payload Specialist 1; Senator E. Jake Garn, Payload Specialist 2. The first "Yuri's Night" (a.k.a. the "World Party for Space") took place with 64 parties in 29 countries on all seven continents participating.